PINCH holds are for advanced climbers. They are small 1 to 2 inch, and used to add difficulty to a climbing wall. Each hold is hand crafted from 100% natural southwest desert rainbow sandstone just the way Mother Nature created it. These hand holds are not just realistic, they are "REAL". They are as close as you can get to a real outdoor climbing experience. Real rock hand holds are strong, long lasting, increase climbing confidence, and build real finger strength. They are great for both adults and children. I personally select, hand craft, and guarantee every hand hold I prepare. These holds are mounted using deck screws, not bolts, and do not require t-nut fasteners. Pinch holds are for advanced climbers. They are small (1" to - 2") and used to add difficulty to a climbing wall. 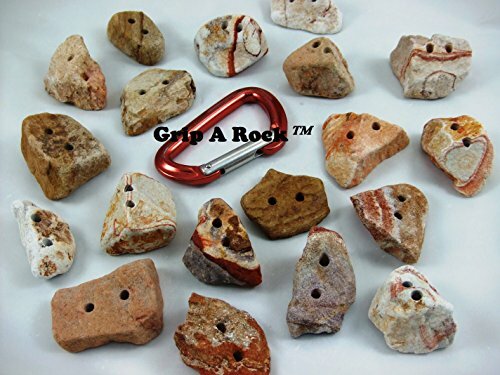 If you have any questions about this product by Grip A Rock, contact us by completing and submitting the form below. If you are looking for a specif part number, please include it with your message.